Fully finished, with a powder-coat finish in bright OSHA yellow and a welded cap, these are quickly installed and very visible. They come in 4" and 6" diameters both made of very strong schedule 40 steel. The 4" O.D. is mounted on an 8" x 8" base plate, 1/2" thick with four 3/4" corner holes. The 6" O.D. is mounted on a 10" x 10" base plate, 1/2" thick, with four 3/4" corner holes. 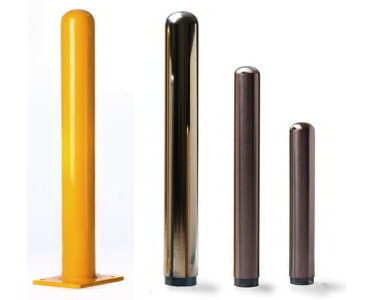 These shiny finish bollards come in 2 finishes: The one second from the left is a galvanized bollard with a mirror finish. The 2 on the right have a brushed stainless steel finish. Elegant and functional, these bollards are perfect indoors for retail, food and shopping environments. Made from schedule 40 steel with either a galvanized or a #304 stainless steel coating. They are appropriate for indoor and outdoor applications. A threaded base is first attached to the floor or other solid surface with 2 bolts which must first be embedded in the surface. The bollard secures tightly to the base. All installation hardware is included. These ship by truck. Please call for shipping quote. These are perfect for protecting water and gas meters, dock doors, and electrical circuit boxes. Bolt-Down bollards ship by truck. Please call for shipping quote.